Super product for your Fur Baby! 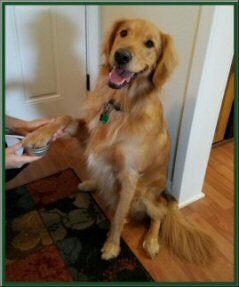 Paw Wax is handmade with 4 all natural ingredients. 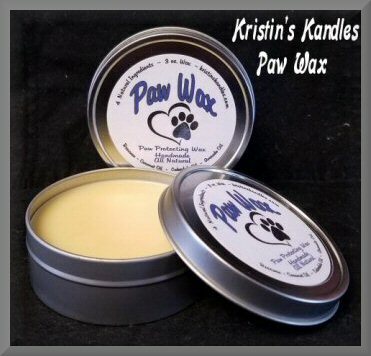 Once applied to the pads of your pet's paws this wax will help in several ways! Keeps snow and ice from sticking to paws. Use to prevent abrasions, burning, drying and cracking. Our Paw Wax comes in this convenient shallow tin so you can rub your pet's paw easily into the wax. 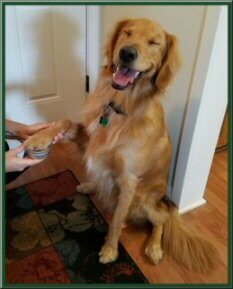 You can also scoop out a small pea size amount and massage/rub onto the paw. 3 oz. of wax in a 4 oz. Tin. Mowgli the puppy is preparing to go out for his walk and wants to be sure to protect his soft pads from the warm sidewalk! 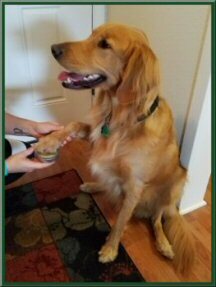 Wallace the Golden Retriever loves to run and play in the snow and our Paw Wax protects his paws and won't let snow stick to his toes! 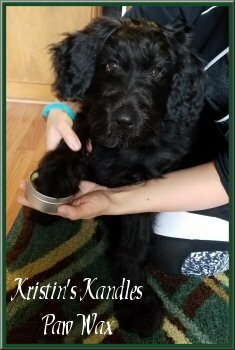 Graphics, website design and layout copyright Kristin's Kandles. All rights reserved.